Canterbury captains Cole McConchie and Frankie Mackay have both taken home the honours of Player of the Year at the annual Canterbury Cricket Awards Evening. In his first year of captaincy for Canterbury, all-rounder McConchie led from the top scoring 825 runs and taking 32 wickets across all three formats. Narrowly missing out on both Bowler and Batsman of the Year awards, Cole’s consistent performances resonated well with his team-mates, as he also took home the Players’ Player award – based on votes after each match. Mackay has certainly had a season to remember as she cemented her spot back in the White Ferns before suffering a season ending ankle injury. The Super Smash highest run scorer hit an impressive 367 runs at an average of 73 in the short ball format while also smashing three centuries in the Hallyburton Johnstone Shield in just six matches. Mackay was just one award short of a clean sweep, as she collected Batsman of the Year, Players’ Player and of course the overall Women’s Player of the Year. Another memorable season was that of Kyle Jamieson’s. Jamieson put his name in the record books when he ripped through the Auckland Aces on new years day, taking the best T20 bowling figures in New Zealand history and third in the world. 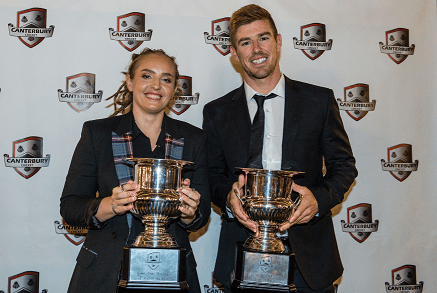 The highest Super Smash wicket taker of the season, Jamieson took home The Supporters’ Star Performance of the Year and Bowler of the Year taking 32 wickets across T20 and First Class formats. Wellington Firebirds recruit Stephen Murdoch finished the season on a high with a Century at Mainpower Oval, that very performance sealing the Batsman of the Year award with 943 runs. In her last year as a Magician, Canterbury leg-spinner Erin Bermingham won Bowler of the Year for the second year in a row taking 23 wickets across both formats, saving her best for last when she took 4-19 against the Spirit. A special award of the night is one that hasn’t been recognised in over 20 years. The record which has held strong since 1998, was broken when Todd Astle took his 291st wicket, cementing his name as Canterbury’s leading first class wicket taker.